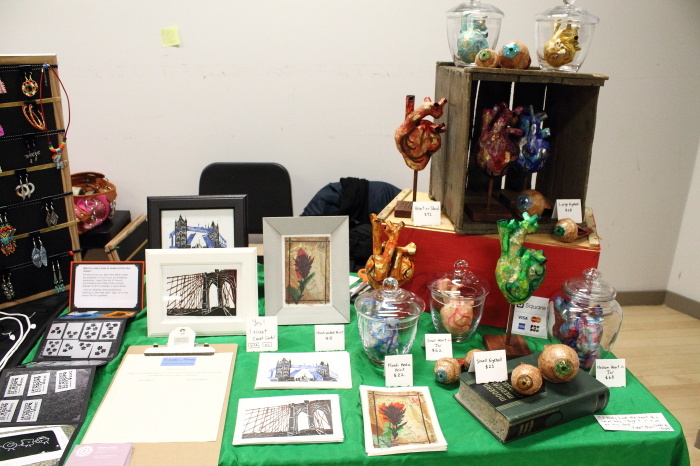 A couple of weeks ago I sold my artwork at a very hip, very popular craft show. Normally this is a very lucrative show for me and I was expecting to get close to selling out. Instead, I sold 4 items over the course of 2 and a half days. It was a little bit crushing. Even when I am selling lots I always have a hard time at these shows since I tend to think that everyone else has better work than me, is further along than me, more professional than me, more outgoing than me, better at selling than me, more well-liked than me. This is something that I'm working very hard to change but it still gets me down, especially when I don't do very well and I can see that everyone around me is raking in the cash and getting rave reviews. For a lot of people I think this fear of not measuring up is what stops them from pursuing their creative interests. It's easy to look at what other people are doing and think "what could I possibly add to that?" The problem is that when we let those thoughts get in our way, we not only deprive ourselves of the joys of creating and sharing our work, but we also deprive our audience of experiencing it - whether that audience is a craft show or gallery customer, or your best friend admiring the card you sent her, or your husband appreciating how you redecorated the living room. Because I regularly find myself in situations where I don't think I'm good enough (selling my art, dancing in front of audiences, teaching classes, being in relationships... it's kind of a common theme) I've developed a few coping strategies that help me to move past the negative thoughts. I'm no expert, and this is still a work in progress, but I would like to share with you what I've learned so far. I used to walk into craft shows and look around at everyone else's work while I set up my table. My mind would immediately start spinning and comparing and I would drop into a deep funk before the show even started. Then I would spend the next few hours trying to claw my way out of it. Lately I've developed a new way of dealing with this pitfall. Since I know that I'm most sensitive to envy and comparison when I first enter the building, I've created a little ritual around that part. Now I walk in with mental blinders on and walk straight to my assigned spot. I set up, focusing entirely on my own space and ignoring what's going on around me. I make sure that I'm happy with how my display looks. Then, I leave. I go for a walk outside, sometimes to get a beverage, sometimes just to window shop if I'm in the right area. I walk slowly and tune into my senses. If it's winter I feel the cold air on my face and listen to the snow crunch beneath my boots. I pay attention to any smells and take in the sparkling snow and lit up trees and store fronts. If I buy a drink, I sip it slowly, savouring the flavours. This helps my nervous system calm down and helps ground me in the present moment. I don't go back until right before the show starts and I feel calm and ready to meet my potential customers. I recommend figuring out what the hardest part of the process is for you and finding ways to soften the stress. If you have a hard time starting a project you could pretend that it's just a rough draft or a prototype (I also do this to help get myself moving). If you're afraid to show your creations to anyone you could make an agreement with a friend or family member that they will only say nice things about what you're making, until you're ready to ask for feedback. An important part of mindfulness is learning to watch your thoughts without identifying with them. This takes a lot of practice but is so rewarding. Usually when a negative thought like "I'll never be as good as so and so" enters our mind we tend to grab onto it like it's the cold hard truth. We feel tense and afraid and think it's the situation that is making us feel that way. We have the thought and we immediately believe what it says. The truth is the thought is just an innocent passerby, an observation that may or may not accurately describe the situation. If we hold onto it, we suffer. If we watch it and let it carry on it's way rather than grabbing hold of it, we feel peace. I do this at craft shows all day long. I watch the thoughts that come in telling me that I'm a failure, that I'll never be successful, that this other vendor snubbed me and that I don't belong. And I tell myself things like, "there comes that old story again" or "how interesting". Rather than attaching weight or importance to the thought, I focus on my senses, smile inwardly, and let it pass. If you want to dive deeper into this practice, I would recommend the works of Pema Chödrön, Byron Katie, and Stanley H. Block. All of these writers examine our attachments to our thoughts and how we let them define who we are and how we feel and they all present their own versions of similar tools and strategies to help let go of those attachments. When I was sitting behind my table halfway through the show, worried that I wouldn't even make back the price of my table, I knew I had to do something. The thoughts were getting more insistent and starting to stick. So I opened up my Instagram feed as a distraction. All too often, when I see something I like, I tap the heart and keep moving through my feed. This time, however, I felt compelled to leave some kind comments. It was almost as though I wanted to soothe myself by saying nice things to other people. It worked. I took it further by complimenting my neighbour on her jewellery and asking her about her process. I went and bought some lip balm from a vendor I had seen on social media. I left my table and wandered around admiring other people's work. These actions filled me with warm feelings but most importantly, they took my attention off myself. It was no longer the Stephanie show running ceaselessly in my mind. By opening up room for appreciation and other people, I felt open to more possibilities as well. Suddenly it wasn't a big deal if I didn't make any money because my awareness had expanded beyond that single-minded purpose. This has also worked for me in the past when I was struggling with a blog post. I've found that leaving a nice comment on someone else's blog cleared the blocks right up. What can you do for someone else to take your attention off yourself? I was very thankful for the people who came and admired my work, even when they didn't buy anything. I was especially thankful for people who gave me suggestions about what to do next. I had a number of people tell me I should do brains (which I had been planning on doing but hadn't gotten to) and I got so excited about moving on to my next project. I had a mental list running all weekend of artwork and other products I could try, and what order I would do them in. Again, it took my attention off what was happening (or not happening), and gave me something to look forward to. It helped me channel energy that might have been negative and burdensome into something new, exciting, and productive. Do you struggle with not feeling good enough and does it get in the way of taking creative actions? If you've found a way of dealing with it please share your secrets in the comments below!